On arrival we will meet our drivers, board our coaches and travel from Shannon airport to the Bunratty where we will enjoy a welcome to Ireland Irish Breakfast. At 09h00 we will visit the acclaimed 15th century Bunratty Castle and the 19th century Bunratty Folk Park. The Castle is the most complete and authentic medieval fortress in Ireland. Built in 1425 it was restored in 1954 to its former medieval splendour and now contains mainly 15th and 16th century furnishings, tapestries, and works of art which capture the mood of those times. Within the grounds of Bunratty Castle is Bunratty Folk Park where 19th century life is vividly recreated. Set on 26 acres, the impressive park features over 30 buildings in a ‘living’ village and rural setting. Meet and chat with the Bean an Ti (Woman of the House) and various street characters including the Policeman and Schoolteacher who give the site its sparkle during the summer months. There will of course be time to stop for one at Durty Nelly’s one of Ireland’s most famous pubs before we depart for Galway. On route we will stop for a light lunch at Paddy Burkes Pub in Clarinbridge and then continue to Galway where we will check in to our accommodation in the city centre. This evening the Mayor of Galway will officially welcome the Group to Galway at a special reception hosted by Fáilte Ireland, the Irish Tourist Board in Galway Museum. You will have the evening free to explore Galway City at your leisure and savor the atmosphere. Today you will march in the St Patrick’s Day Parade in Galway City. Pipe bands, Dance Groups and Performance Artists come from all over the world to Galway each year to experience a parade that is widely regarded as one of the best in Ireland. The beauty of the Galway Parade is that it is small enough for group to truly feel a part of, yet big enough to create a special atmosphere. Up to 50,000 spectators line the streets each year and some of the narrow streets create an intimate cauldron that is an unforgettable experience for all participants. The Parade route is thronged with spectators from start to finish, creating a non-stop carnival atmosphere. This morning we travel by coach along the Connemara Coast road to Rossaveal where we will depart by ferry to Inis Mor the largest of the 3 Aran Islands. Inis Mor is criss-crossed by dry stone walls and the landscape is bleak with soaring cliffs rising out of the Atlantic. Aran has retained much of old Gaelic culture and Gaelic is still the spoken language of the Islanders. 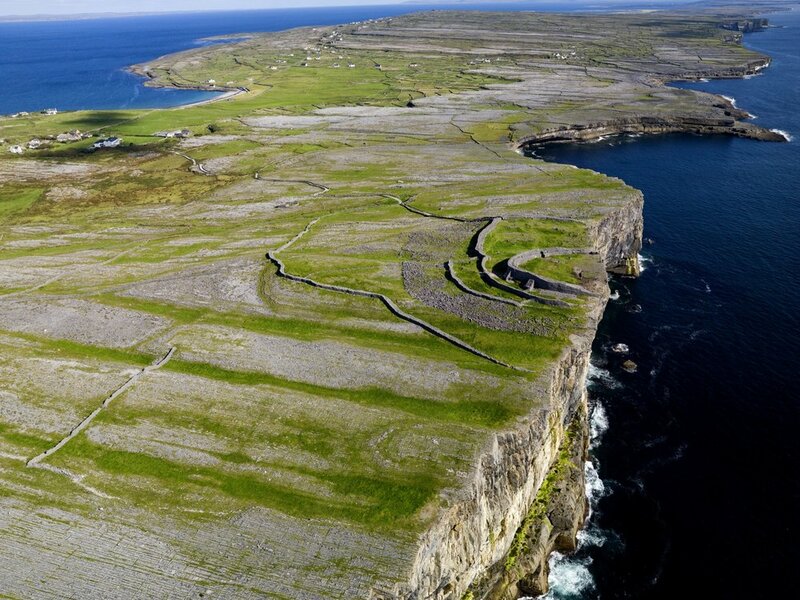 On arrival to Inis Mor we will enjoy a guided tour with a local expert who will bring us to The Dun Aengus Fort, a 4000 year old fort situated on top of 400-ft high cliffs. Dun Aengus Fort is just one of 27 nationally protected monuments on Inis Mor — more than anywhere else its size in Ireland or even in Europe. We will enjoy the austere landscape and marvel at the coastal views. Lunch is organized in Joe Watty’s, a thatch pub with an excellent reputation for great food and music. We will be entertained by musicians and Sean nos (old style) dancers, a form of Irish dancing traditional to the Island. There will be time to explore the village before boarding a return ferry to Rossaveal. The evening is at your leisure to explore the pubs and restaurants of Galway City. A visit to Ireland for St Patrick’s Day would not be complete with out making a visit to Connemara.